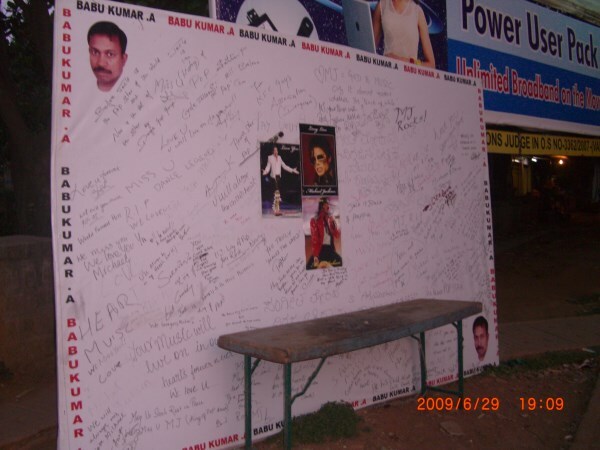 The photo you see is a condolence board kept at the corner of CMH Road and 100 feet in Indiranagar. People have been writing for the last few days on this ‘open’ condolence book (open source I guess!). What happens to this board later? Will it be sent to Neverland? It will ‘never’ reach there. A photo in Bangalore Mirror showed the students of Mount Carmel college standing for a minute of silence to condole his death. Crazy in my opinion. Dancers from the Kannada film industry went on a ‘fast’. They must be knowing MJ pretty well. July 6, 2009: The Karnataka Film Dancer’s Association in Gandhinagar (Bangalore) plans to hold a 11th day death ceremony, Vaikunta Samaradhane, which marks the conclusion of the mourning period. This is stretching.. I agreed to your blog. Specially what you wrote at last para, But we all are music lover’s & he was the king of pop, King of music, So that’s why people done all this thing for him, Even we all do for our soldiers…. !